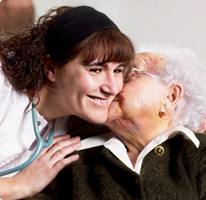 Landmark Health is making in-home care available around-the-clock for eligible members. Landmark Health is partnering with CDPHP to deliver in-home care to some of our frailest members. To be eligible for the program, members must be enrolled in one of our Medicare Advantage plans in Albany, Schenectady, Rensselaer, or Saratoga county, and have six or more chronic conditions. The Landmark in-home visits are designed to support your efforts to keep your most complex patients healthy at home; they do not replace your office-based care. If one or more of your patients is targeted for inclusion in this program, you will be notified and kept updated on the services delivered. Landmark will work closely with you to help coordinate your member’s care. Landmark professionals available at no additional cost to members include: doctors, nurse practitioners, nurse care managers, social workers, pharmacists, dietitians, behavioral health practitioners. On average, a Landmark provider will see the patient at least once a month for regularly scheduled visits and any time he or she is needed. Patients have direct phone access to their Landmark provider 24 hours a day, seven days a week. Visit the Landmark Health website to learn more.